​Managing data quality for a healthcare organization requires numerous people willing to commit time, energy and resources to support a comprehensive plan. The Data Governance Charter of Carilion Clinic provides the strategic plan implemented by three organizational units: data governance council, data stewardship committee, and others responsible for quality of individual data elements throughout the organization. 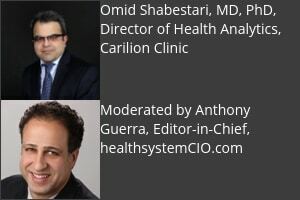 Carilion’s data quality initiative consists of 1) formalizing the data governance council and data stewardship committee, 2) creating and organizing a comprehensive business glossary for the organization, 3) providing visualizations of the EHR data quality using web-based dashboards, and 4) establishing goals for data quality improvement through the use of KPIs and prioritizing based on availability of resources and organizational needs using the Responsible, Accountable, Consulted, and Informed (RACI) model. For information on sponsoring this event or other upcoming healthsystemCIO.com opportunities, check out our Webinars, Surveys, and Private Dinners Calendars, or contact Nancy Wilcox. To review all programs, see our Media Kit.